Find here the latest Tips & Tricks to increase the possibilities of your forums on Topic'it. To best fit the needs of forum owners, the Topic'it service allows you to configure many options directly in the forum administration panel. One of these configurable options is the Topic'it signature. 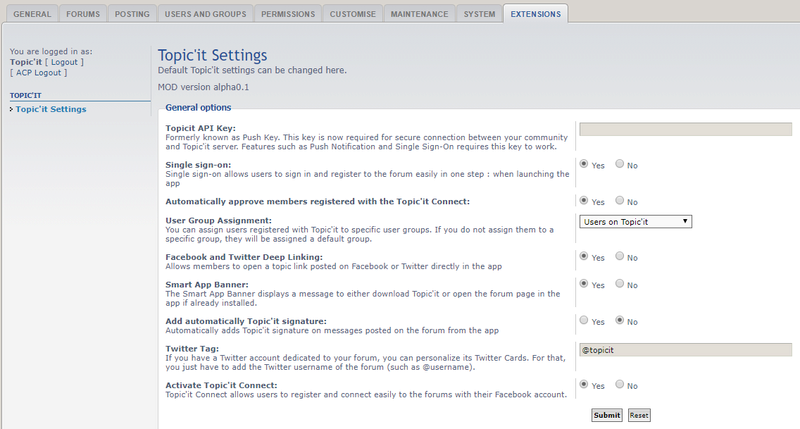 Indeed, you have the option to enable or disable the Topic'it signature at any time and for all members of the forum. Here is the solution to not display the Topic'it signature on your forum. What is the Topic'it signature? Sent from Topic'it App for English forums. The idea is to arouse the curiosity of the members and to know if some members use the application Topic'it to participate in the discussions. You will notice that there is no link in the signature for example. How to disable the Topic'it signature on a Forumotion forum? The Topic'it signature is an option enabled by default on Forumotion forums. It is managed by forum and not by user. So you have the option to disable it for all members of the forum easily. Go to your Forumotion forum and log in with a founder or admin account. Go to the admin panel of the forum. Click on "Modules" then on "Topic'it> Configuration". Choose "NO" for the option "Add Topic'it signature in forum posts". How to disable the Topic'it signature on a phpBB forum? The Topic'it signature is an option enabled by default on the phpBB 3.0, 3.1 and 3.2 forums that have installed the Topic'it plugin. It is managed by forum and not by user. So you have the option to disable it for all members of the forum easily. Go to your phpBB forum and sign in with a founder or admin account. Click on "Extensions" and then on "Topic'it Settings". Choose "NO" for the "Add automatically Topic'it signature" option.